Well, it's been a while, but I'm going to start doing the reports again, as the market seems to be making some moves. You wouldn't know it from this chart though. Sure, we see a little uptick in the actives- but nothing crazy. Sales are down though, and that has begun to soften the HSI, which dropped sharply in the spring, but remains close to 200. In a Similar fashion, we see home sellers remain as optimitic as ever, and buyers are - so far - chasing them. It remains to be see how long that continues though. There have been a lot of price changes, and I think eventually we're going to need to see sellers pricing closer to where the market is at. What should potential home buyers do in Shrewsbury ? Well, there are some options out there - and some motivated sellers. You can be pickier than you have been in some time. And, oftentimes, you can pay less - or basically not see too many bid wars. There really haven't been intense wars this spring in Shrewsbury, except on a few houses. There will be less of that, if inventories keep builigng, and transaction volume keeps falling. Sign me up for Automated E-mail Alerts of New Listings in SHREWSBURY! Is this an Old Report? Get the updated one here! What should future home sellers do in Shrewsbury ? There are 98 homes actively listed as For Sale for Home Buyers. In Shrewsbury there have been 240 houses sold in the last 6 months, and 94 homes sold in the last 3 months. The Average number of Days on Market was 26 days for recently SOLD homes In Shrewsbury . 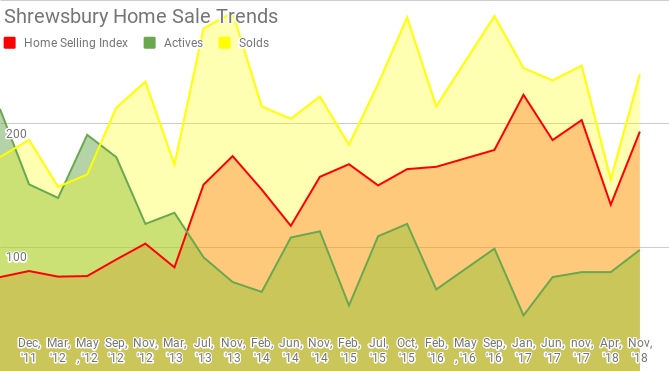 Homes for sale have been sitting for an average of 80 days homes For Sale (currently for sale). There was an Average Sold Price of $507,937 . Shrewsbury , MA, has 1 properties advertised as lender owned or foreclosure (typically foreclosure) .